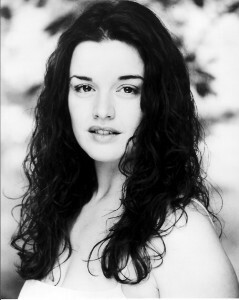 Dianne Pilkington trained at the Guildford School of Acting and made her professional stage debut in Les Miserables (West End) in 1997. Beast (UK tour), Tonight’s the Night (Victoria Palace Theatre) and Cats (UK tour). At the time of the interview Dianne was starring as young soprano Sophie de Palma in Terrence McNally’s fabulous play Master Class at the Vaudeville Theatre. Despite her very busy schedule and a new puppy at home – a Labradoodle called Ludo – Dianne kindly took some time out to answer a few questions about herself and her career. Have you always wanted to sing and act? No, I wanted to be a writer, teacher or librarian – anything with books! But I love my job! You are originally from Wigan but came ‘down south’ to train at the Guildford School of Acting. Did you enjoy your time there? I had a great time at GSA, I did a lot of growing up there. You began your professional stage career in the West End in 1997, in the hit musical Les Mis at the Palace Theatre. A brilliant show to make your debut in! You were part of the ensemble and also understudied and played Fantine and Cosette. What was that experience like for you? Les Mis was a great experience, full of great performers to learn from, which is so important. You subsequently appeared in numerous other musical productions, such as Sweeney Todd (Bridewell Theatre), The Beautiful Game (Cambridge Theatre), Taboo (Venue Theatre), Beauty and the Beast (UK tour), Tonight’s the Night (Victoria Palace Theatre) and Cats (UK tour). What are some of your highlights of your time as part of these productions? Sweeney Todd was wonderful and challenging as we did it in promenade, and The Beautiful Game was great as I got to work with some heroes of mine. Beauty and the Beast was like a little girl’s fantasy with those costumes! I saw you as the good witch Galinda in the very popular (no pun intended!) musical Wicked back in 2008 and was really impressed by your fabulous performance. You played this demanding role for 3 years. Please share a memory or two. I was very clumsy, I knocked off my tiara with my wand spinning, and accidentally slapped Kerry more than once! You said in an interview a few years ago that you like to try new things. After playing G(a)linda, you decided to finally give straight plays a go and starred in the fast-paced and very funny play The 39 Steps. How did this compare to musical theatre? It was liberating not to sing! But I missed it by the end. I learned a lot from working with the three actors about different approaches. You are currently starring in another play as young soprano Sophie De Palma, in the new West End production of Master Class at the Vaudeville Theatre. In a nutshell: What is the play about? The play is based on real master classes that were given by Maria Callas, played by the fabulous Tyne Daly. Your character Sophie is the first student to experience Callas’ teaching methods. In your opinion, is Callas a ‘good’ teacher? Yes, she is finding her way as a teacher, but has so much to share. What do you think is the message behind Master Class that the audience should come away with? To root everything in the truth. I saw a German production of Master Class about 10 years ago and still remember how much I loved it. In your words: Why should people go and see Master Class? People should see it either if they love Maria Callas, or if they don’t know Maria Callas. It is a fascinating insight into an amazing life. And it’s very funny too! You are a fantastic singer. Would you like to do more opera singing in the future? You released your debut album “Little Stories” in 2010. Will there be a new album soon? I am sure there will be. I’d like to collaborate with my husband on one. Crazy for You – because I love Stephen Mear and I have friends in it! What other roles would you love to play and why (in any musical/play)? I’d like to do more Sondheim. And I love Eastenders. Hint hint. You appeared in the West End edition of The Weakest Link in 2008 and came 4th – not bad! What was it like to be on this popular show? It was one of the scariest moments of my life! You and your husband got an adorable chocolate Labradoodle puppy called Ludo last September – you introduced him on Twitter. How is Ludo doing? Ludo is the most beautiful dog in the world, and such a good boy! Walk Ludo with my husband. Thank you for the huge support, even my random tweeting and gabbling nonsense at stage door is put up with! Thank you very much for your time, Dianne and all the best for this run of Master Class!